DEVI's grew from humble beginnings and Ross & Tanya's honest love of food. We believe in conscious cooking, food made mindfully and that is enriched with heart & spirit. We create the food that is most precious to us, food that is shared, steeped in culture and made with love. Our recipes encapsulate the osmosis of ingredients, marrying Mediterranean cuisine with that of North Africa, the Middle East, Ancient Persia and India. Our food is meat-free and vegan friendly. We source responsibly with organic dairy from British farms, and produce as seasonal & as local as possible. Our freshly grilled Tandoori breads are made in an artisanal Afghan bakery in South East London. Our packaging is eco-friendly, made from natural, sustainable and renewable plant materials that can be composted or recycled after use. Our suppliers, Green Man Packaging, plant new trees through their woodland partners, with each new order starting a new cycle of growth. 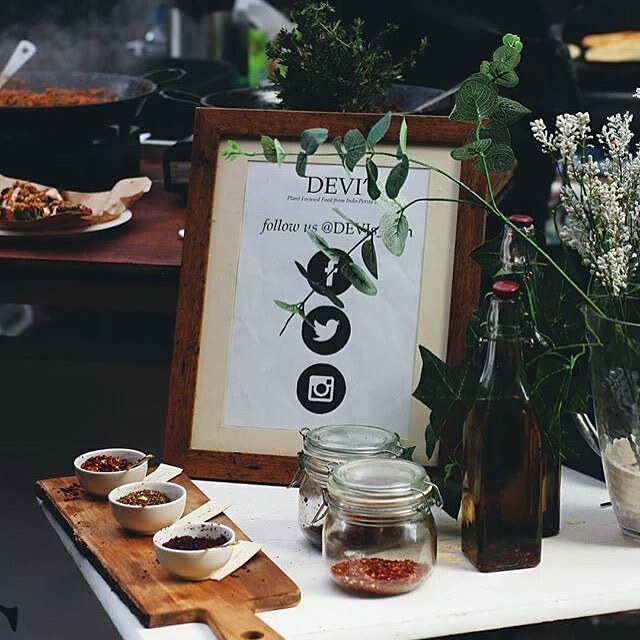 DEVI's reinvest time and profits into hosting female empowerment projects. We are deeply passionate about gender equality, the refugee crisis and women's rights.